Hotel Wales offers limited time savings on summer stays in the city’s Upper East Side. This offer is the perfect opportunity to experience Manhattan like a local. Beginning June 6th, Hotel Wales will offer travelers limited-time savings of 25% on summer stays in New York City. Guests who book a stay of two nights or more on the Upper East Side of Manhattan at Hotel Wales, and travel through 9/11/2016 receive 25% off accommodations, as well as an unlimited-ride MetroCard to explore the city, during the Summer Like a Local Sale. Applicable to all accommodation types, including deluxe and family suites, this seasonal sale makes access to one of Manhattan’s most coveted neighborhoods, the Upper East Side, more affordable than ever. Guests at Hotel Wales will also enjoy complimentary Wi-Fi, 24-hour coffee and tea, and access to the Rooftop Terrace, which offers sweeping city and Central Park views, during summer stays. Hotel Wales’ Summer Like a Local Sale is live 6/6 – 6/13/2016 with promotional savings of 25% on stays of two nights or more, plus an unlimited-ride MetroCard. This offer and fare are non-refundable and valid for travel 6/20 – 9/11/2016 only. Access this limited-time offer by visiting sale.hotelwalesnyc.com. 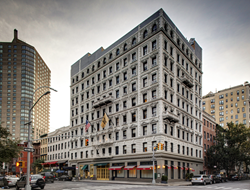 Hotel Wales is a boutique Manhattan hotel offering 46 standard rooms and 43 spacious suites on the Upper East Side one block from Central Park on Museum Mile. Hotel amenities include complimentary Wi-Fi, a sprawling second floor Carnegie Lounge, a scenic rooftop garden, onsite dining, a fitness studio and elegant meeting space. Leisure travelers enjoy the hotel’s proximity to iconic museums and one-of-a-kind shops while business travelers relish easy access to Mount Sinai Hospital, NY Academy of Medicine, Parsons, and Hunter College.